Demand Foresight’s Demand Commander takes the first step in collaborating with customers and partners by making sense of voluminous point of sale, EDI, and customer inventory information. Demand Commander can also be used directly by partners or customers if needed for further accuracy improvements. The ultimate goal of Demand Foresight is to help organizations find consensus on the most profitable path forward. One way to do this is to allow for easy collaboration among relevant groups inside and outside an organization. Depending on the process our customers have in place, Demand Commander is easily configured to support this type of interaction. Whether sales owns the forecast, with input from planning, marketing, and finance, or some other process exists, Demand Commander is there to make it easy for everyone to see the forecast, and what’s behind the numbers, as it tracks through the organization. The key is that Demand Commander starts with a better computer generated forecast than any other product available today, and internal groups need only change the forecast when exceptions occur. From day one, Demand Commander users start with a better forecast than ever before. By the time the organization is done with it, the error will be reduced by 25% to 50%. Demand Commander’s full effectiveness is achieved when salespeople or other groups closest to the customer have inputs into the system. However, we recognize this may not be possible for all organizations. The following is a best practice approach involving sales, but any number of groups in an organization involved in forecasting can drive these functions. A forecast has to be trusted to build consensus. Software has to be intuitive to gain acceptance. Demand Commander starts with a better baseline forecast but it also makes it easy for organizations to build consensus around it. With Demand Commander, everyone in the organization (including partners and suppliers if needed) can see the forecast, and easily add to it what they know to be different, i.e., price changes, supply constraints, promotions, etc. For example, if planning is questioning the likelihood of a salesperson’s forecast they can instantly drill down into it to find out why the demand is projected to be at that level without picking up the phone. Demand Commander automates some of the decision-making users are comfortable with, while simultaneously presenting decision support tools to help with others they are not. 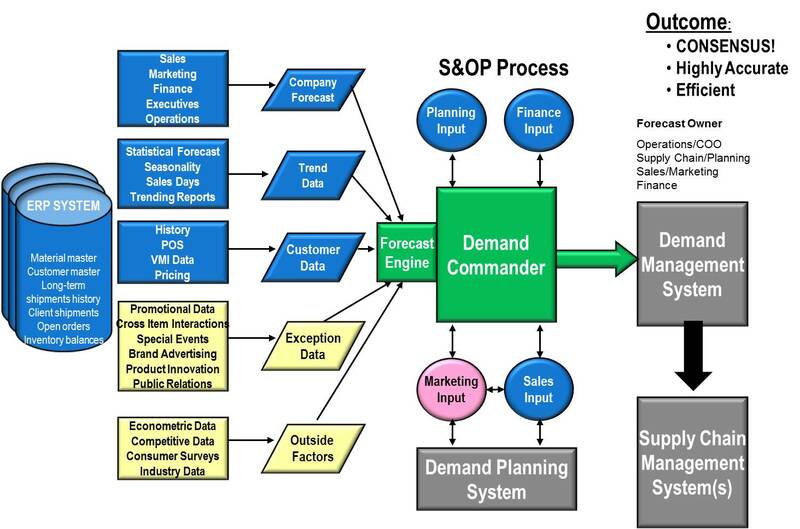 As an example, Demand Commander creates one forecast for a company to work from. Changes to this forecast become the exception, as sales and planning realize the power of the computer generated demand information and shift gears to spend more time selling, managing promotions, or dealing with supply chain issues. Our forecasting engine gains in its ability to make decisions more accurately over time increasing the trust of its users. Customers recognize this and are automating more decision-making the more they use the system. With Demand Commander companies can create more accurate plans. Sales can work un-tethered and at their own pace, whether at the airport, in a customer’s office, or on the network and go over promotional plans, review forecasts, and look at sales data with no need to worry about network connections or system performance or speed.. Also, all users can take their time and use Demand Commander as a workspace to get the forecast just right, looking at all levels of aggregation, before submitting it for review. During implementation, Demand Foresight will work with your organization to set up the proper workflow and data access requirements for your individuals in your company.